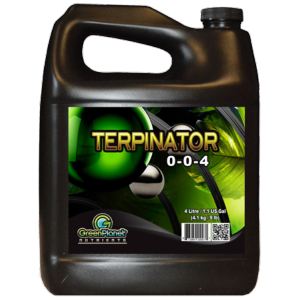 Terpinator is formulated to increase the concentration of terpenoid in aromatic plant oils and glands. The unique composition of Terpinator provides the basic building blocks that plants require to produce flavourful oils. By using naturally occurring plant and biological compounds, unique enzymatic pathways within a plant's body are utilised to enhance the production of terpenoids and plant oils. Terpinator also catalyses the steps in a plants metabolism that will protect and prolong fragrances of your plants dried fruits and flowers.